For our daily post prompts NaBloPoMo, Eilonwy and I chose "projects" for Wednesday. She has a great post about a lovely hat that she hacked the pattern on so she could wear it while her hair was in a bun. 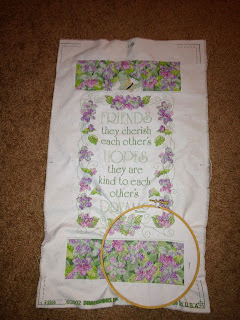 I have an embroidery project I started in 2006. 1 - My house gets a little cluttered sometimes. 2 - I'm not crafting nearly as much as I would like to be. 3 - I moved in to this apartment over a year ago, and the office/library/guest bedroom is still a crazy, disorganized mess. 4 - We still haven't painted that hutch we bought a year ago. 5 - I took a break before I wrote number five to send Sisterpants some information she asked me for two weeks ago. And you know what? That's okay. My house is mostly clean. Blake and I are fed and dressed every day (he dresses himself and cooks breakfast for us each morning). I'm getting to my projects and hobbies when the mood strikes and time is available. A lot of energy is going into work lately, where I also have several projects and many demands on my brain power. Both at work and at home I feel like I'm trying to play a lot of catch up and if at the end of the day only the urgent and important things are done? I feel good about it. Life is a pretty good project to keep working on. I have a sweater I've been knitting since October General Conference 1997. I really ought to finish that thing.